I wish I could give you more background about this piece of art, but sadly, like many topics from the Holocaust generation, there was little discussion about family heirlooms. I do not know when and where this Adar picture was bought. The picture is from my husband’s side of the family. They come from the Carpathian Mountains region of the Ukraine. We know nothing else about the piece. I cannot open the back to see if it was signed because the frame is nailed shut, and I worry that if I pry it open, the whole thing will fall apart as the wood is quite old and fragile. 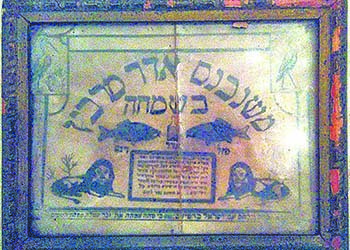 What you have in your possession is what is known as an “Adar poster,” dating to circa 1910-30. It makes perfect sense for this to have come from the Carpathian Mountains region, as Adar posters such as yours were popular in that area, as well as in Poland, Hungary, and Slovakia. It was customary to hang decorations such as yours on the synagogue wall at the start of the month of Adar, and for them to be taken down once the Purim holiday concluded. 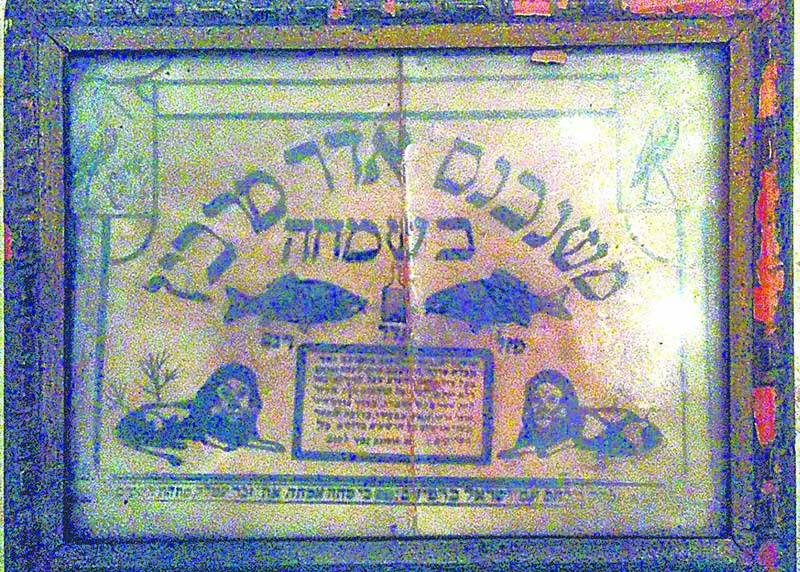 The most coveted Adar posters are hand-drawn examples and are quite rare. However, as you probably know, your example is a print, and over the years I have seen other prints very similar to yours – with the flanking lions on the bottom, a pair of fish in the center, and pelicans at the top. I can see that there is a severe vertical split in the center of your piece, which does affect the value. The poster might have a printer’s mark somewhere on the front edge, being covered up by the frame – which, if found, would greatly help to ascertain approximately when it was made. To stabilize the split and prevent further damage, you may want to consider taking this to a professional so it can gently be removed from the frame and mounted on a linen backing. If your print did not have that split, it would have a value of $400-$600. However, in its present condition, the value is only $100-$150. My father bought this chanukiah somewhere in Europe or in Asia between 1925 and 1945. There are no hallmarks. That is all I know about its history. The design of your chanukiah is quite well known, having originated in Germany around 1890. Your model and similar examples (some more elaborate, some less so) were very popular, and were produced in such substantial numbers from 1890 through 1930 that many examples exist today. In fact, this type of chanukiah, where eight fully formed lions have their mouths open for the placing of the oil wicks, is so desirable that well-made copies began to be made during the 1950s and are still manufactured today. The lack of hallmarks is worrisome and leads me to believe that your chanukiah is a post-war made copy, as an original, pre-war made example from Germany would be clearly marked with an “800” on the base at the bottom (for .800 silver content), along with the German national marks of a crown and a crescent moon. In Hungary during the 1950s, original molds and dies of various silver Judaica objects from pre-war Germany were used to reissue these “classic” pieces, with one difference: They were made of sterling silver, which is .925 silver content. Often these reissues are completely lacking in hallmarks, like your example. So, I have a job for you: Take your chanukiah to a local jewelry store and for $5 or $10 (or free if they’re nice), they will test the silver content. If it is made of sterling silver, it is certainly a post-war made example (which would contradict the family history you have given me, which happens quite often), with a value of $1,000-$1,500. If the silver content is of .800, the value is $1,500-$2,000, but not more, as it is still lacking the appropriate hallmarks, which is what buyers want when acquiring a pre-war made piece. If your chanukiah had said hallmarks, the value would be $3,000-$4,000. I’m hoping you can tell me if this kiddush cup is anything special or is valuable. Thanks for your time. Your kiddush cup has the hallmark on the base of “Zadok Brothers,” who made silver Judaica objects during the 1950s in Israel. 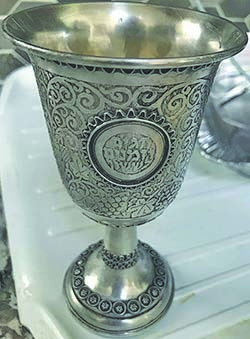 Your cup, which has decorative designs of grapes and vines, the Hebrew verse relating to kiddush, as well as cast plaques of holy sites in Jerusalem, has a value of $200-$300. 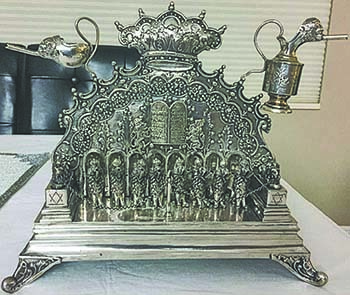 We are hoping you can provide some information about this menorah. It belonged to my father, and might even have been his father’s. Thank you and warm regards. Your chanukiah belongs to a group of chanukiot that were made in New York beginning around 1920 and ending during the 1940s. 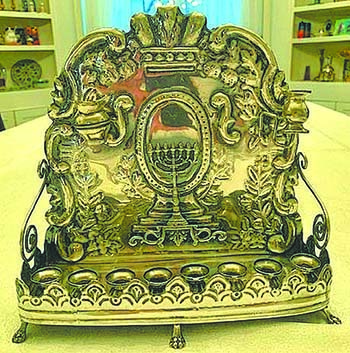 They all have the same basic form, including a backplate with a depiction of the Temple Menorah in the center, eight cups in front with a skirted guardrail, and the entire piece resting on animal paw formed feet. Based on the level of manufacturing quality along with the photos of the hallmark you provided, your example appears to have been made during the 1940s. Value: $700-$900.